A stitch in time saves nine. The old adage is a true on your sailboat today as it was for your grandmother darning socks a half a century ago. And it’s just as true aboard the Christopher-Jin this winter. Maintaining a sailboat takes just about every skill you can imagine, from painting and scraping to plastics and resins, woodwork to metal work, electrical and electronic equipment, sails to cushions, and life-saving gear, propulsion, navigation, and art. A sailboat is a mini-world and island at sea. So let’s tackle some of the software aboard your vessel, and I’m not talking about computer software but the many, many items that are made out of fabric that you can build or repair. Let's beging with the basic equipment you will need and then you can head to the Project Gallery and find a host of items that you can build or repair for about half the cost or less of buying finished goods. Any sailor worth his salt can handle a needle and thread (or sewing machinge) as easily as he or she does the tiller!!! Seriously, sewing parts for you boat can be both rewarding and profitable. A good place to start is SailRite. They have all kinds of great ideas, kits, references and supplies. My suggestion is to get a good consumer grade sewing machine, like a Singer, and get your feet wet before you pop for the big industrial type sewing machine. 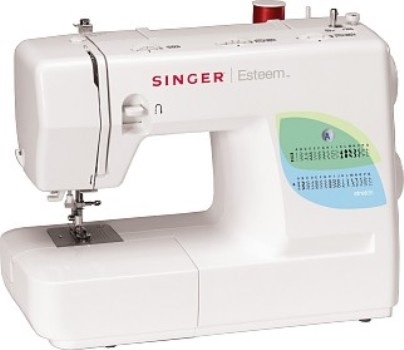 I have built all my Sewing Projects on a simple Singer Esteem Sewing Machine that I got on sail for $100. If you are serious about really getting into some heavy duty sewing than I sugget you search for a good semi-pro machine. I will be doing that soon as my latest project was a little less than perfect because trying to sew with heavy sail thread through 4 layes of sailcloth didn't work so well with my little machine. The machine you use should be able to sew a zigzag and should have variable tension, stitch width, and stitch length, and reverse. This will get you started but if you are like me you'll soon need a sewing tote to hold all the items you'll pick up along the way.